Picture rail in a new build? Period features v modern? So I am looking at purchasing my first home, but a used to (and love) period features. 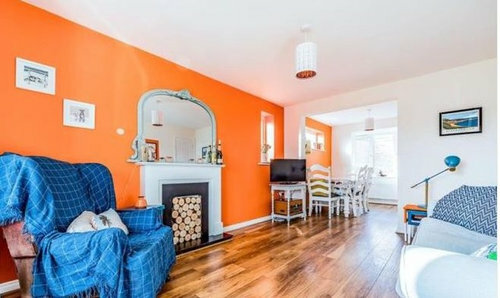 What are peoples thoughts on features like a picture rail in a newer property? 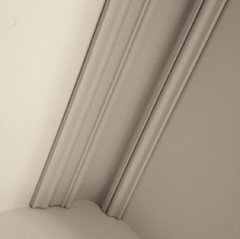 Personally I don’t think you have the height in this room for picture rails but how about a simple cornice and higher quality traditional skirting boards? Totally agree nice flooring and a traditional fire surround also would look great. I would live in it first and see what happens. 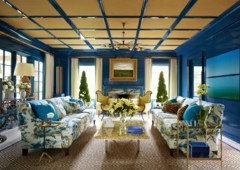 I don't think it is possible to impose a style on a room until you occupy it. appreciate the input from everyone! I would add a Victorian style cornice swap the skirting boards for something a little fancier and then paint everything in a flat Matt finish. You could also build a fake chimney breast to give the room that period feel. I like your floor idea too and if you add skirting after you won’t see edges. Or, embrace its newness - adding ‘Victorian style’ is going to look faux (as it would be). 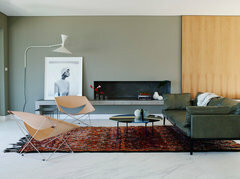 Search Houzz contemporary living room photos for lots of inspiration. You have a lovely light room to work with. 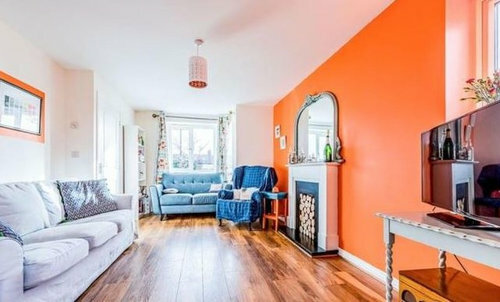 Hi James, this looks like a nice bright room. My advice would be to live in the house for a time before you make decisions on decor and lighting. How a room is lit at different times makes the difference between a space you can enjoy at all times and one that only looks good at certain times. It is is best and easiest to have the wiring done before you make alterations and decor choices. You will also be able to consider how to ‘zone’ the space to create, not just your dining area, but also potentially some work space. It will also give you time to consider how to dress the window to again optimise light. A trip to the library would also allow you to cheaply pick up some books on design and how to do your own mood board. Best of luck. Hi! I would add coving as I think it always improves a room as do ceiling roses. You don't have to go for something fussy but it will add some of the character that you are missing. I agree with the other comments on changing the skirting for a larger size. Good luck with your renovation plans! Jonathan / Soraya – Again, thanks for the advice. I certainly will be exploring coving options – the projection in to the ceiling on yours Jonathan I like and would be effective with the wall heights I think. I’d be careful with the skirting to get dimensions to vaguely mirror each other, so I don’t end up with an imbalance. Certainly will be exploring. Cheers! I would disagree about coving. It can look good in the right properties, but wrong in some modern ones. I ripped out all of my naff coving that a builder had put in our house and it improved it instantly. I found this image and thought the colours and proportions may be of interest to you. I do like the shadow gap there in lieu of coving, but that would be a bigger job to create that. Increasingly agree that I perhaps would have to live int he space for a while first and try a few samples out in situ to see how the various ideas would look. Excited to see what could develop though! I love the photo from @colourhappy! That green wall is fab! Plus, the amount of money you could spend on coving etc you could splurge on a characterful rug, art etc. Shall keep researching and working out mood boards and see what happens if the sale goes through! Keep looking until something makes you say wow, it could be a colour, a piece of furniture, an accessory, texture, anything you really like and work from there. Likely going to come down to your personal preference. We brought a 70’s mid terrace, standard height rooms (IMO) and they had put up picture rails. Personally I wouldn’t have done but for the way we have recently decorated it, it actually adds height to the room, which I think is down to a trick of the eye, so they have grown on me. Just keep in mind if you put them up you may struggle to get them off if you change your mind down the line without having the risk of needing to replaster. I’m in the ‘no Victorian features in your new build house’ camp. 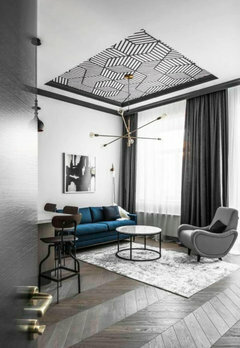 There are some interesting modern picture hanging systems around these days that may work for your home. Maybe worth exploring. On a completely unrelated note, why do some people say “brought” instead of bought? Is this a posh way of saying it? Haha posh way of saying it. To be fair I wrote that the way I said it, so purely down to my poor use of language. What's your dream house feature? Is this picture rail original 1930s?